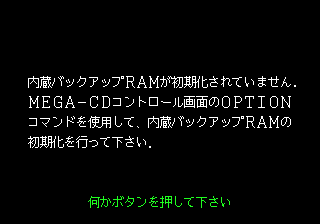 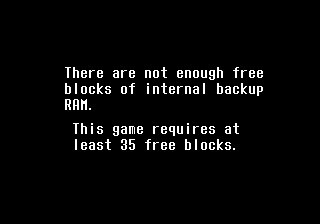 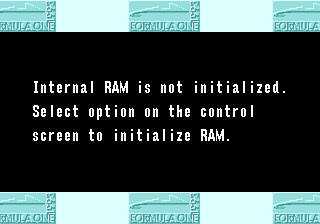 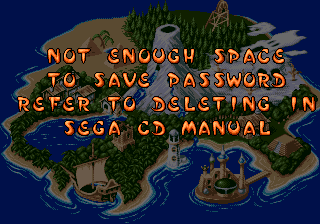 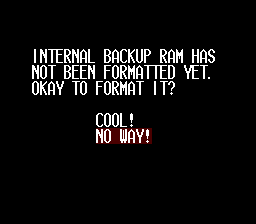 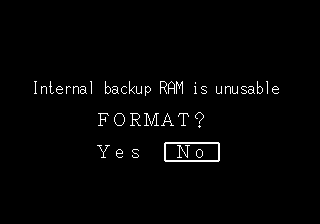 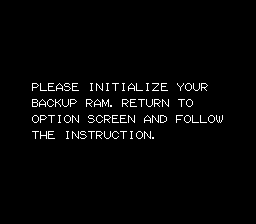 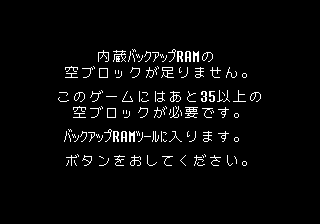 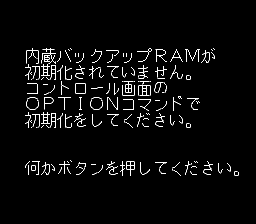 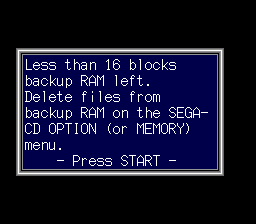 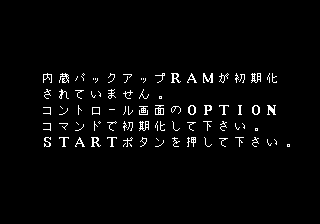 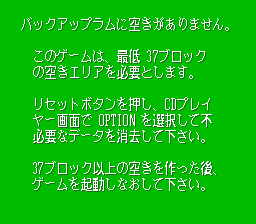 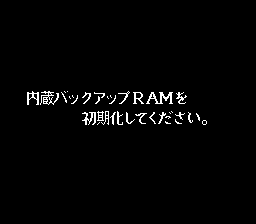 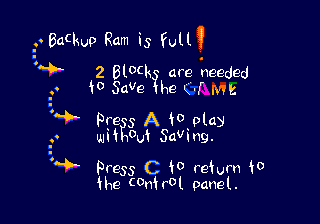 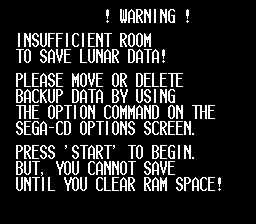 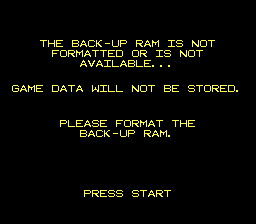 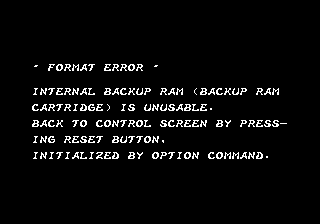 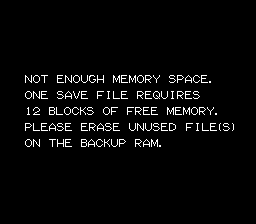 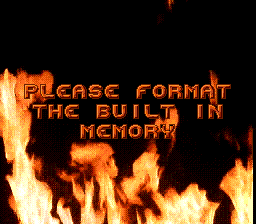 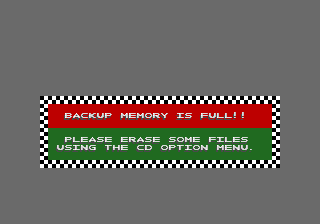 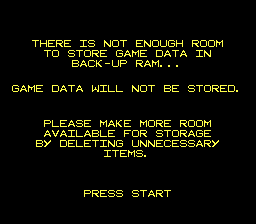 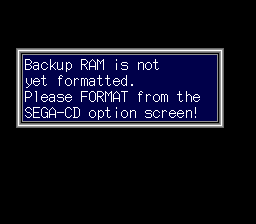 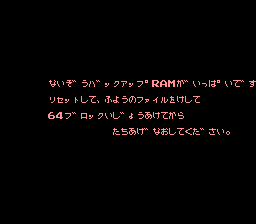 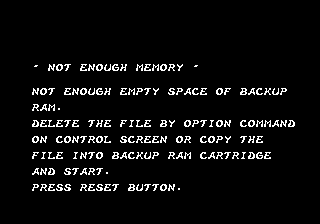 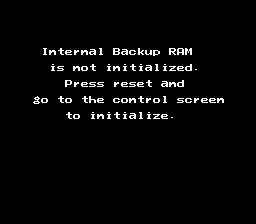 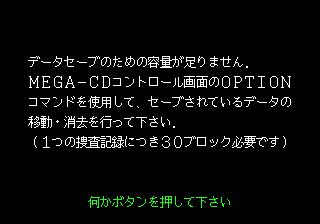 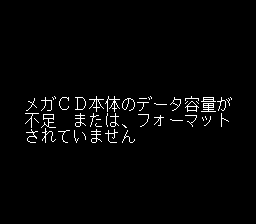 TurboGrafx CD / TurboGrafx-16 / Sega CD WARNING messages. 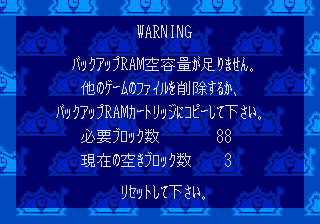 "WARNING! 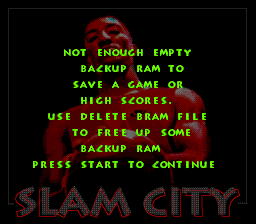 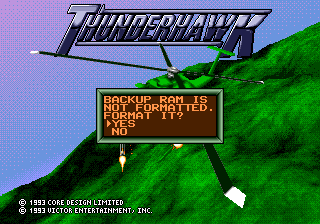 This game cannot be initialized"
The TurboGrafx CD recieved an upgrade in the form of the Super System Card, which added more RAM to the system and allowed more complex games to be made. If you tried to play some games without the required System Card, then a warning message would be triggered alerting you of such folly. 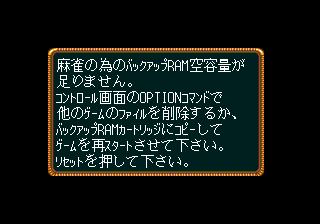 There's yet another upgrade card, called the Arcade Card. 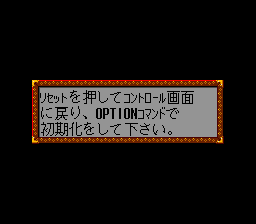 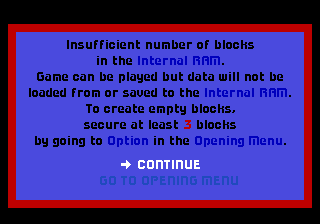 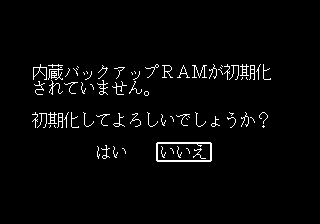 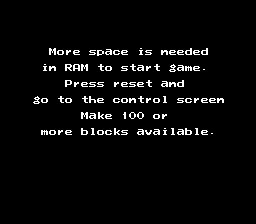 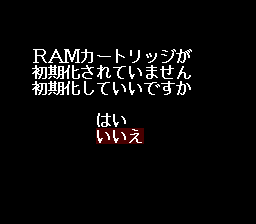 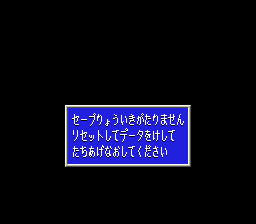 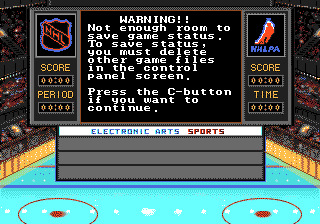 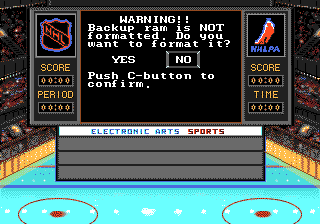 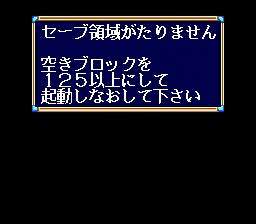 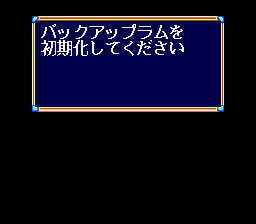 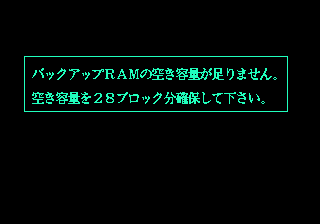 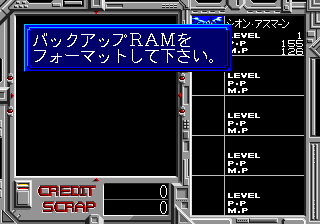 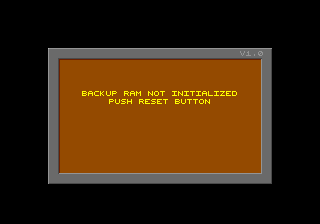 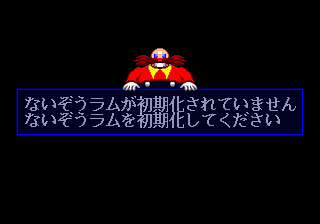 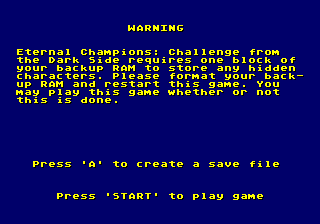 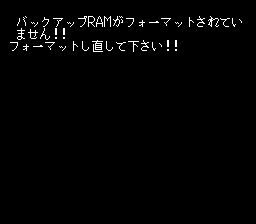 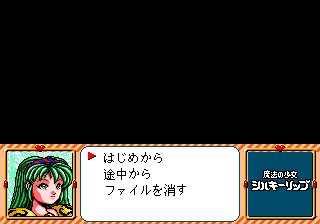 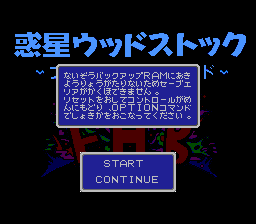 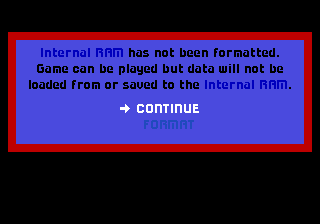 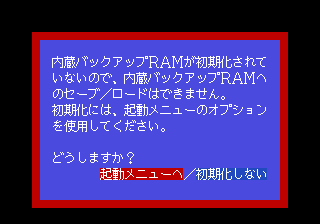 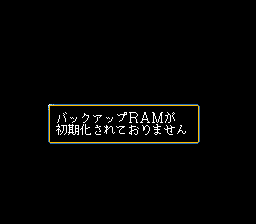 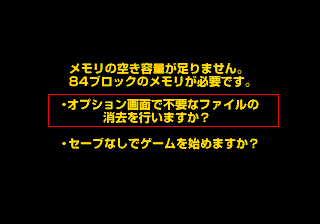 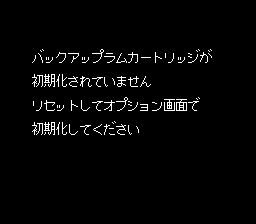 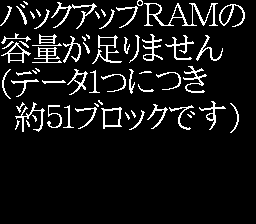 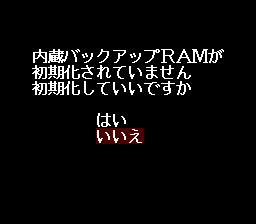 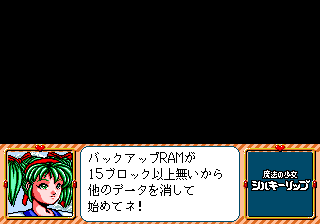 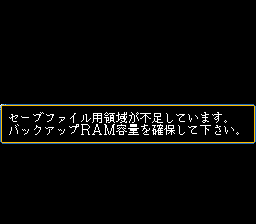 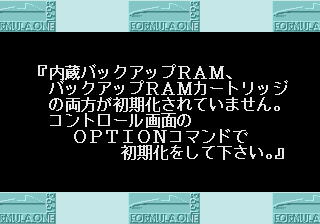 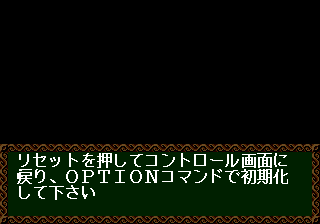 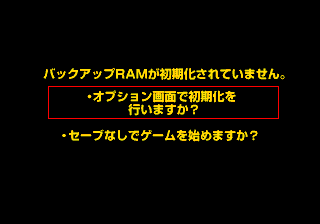 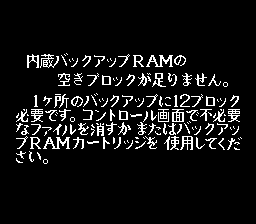 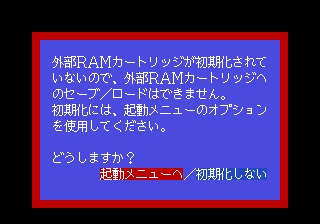 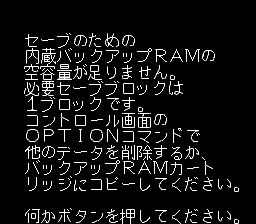 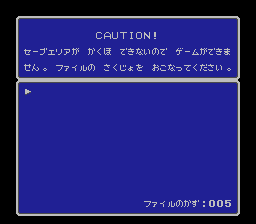 On top of also showing warning messages for not having the Arcade Card for certain games, it also has messages if a game has been enhanced by the usage of such card. 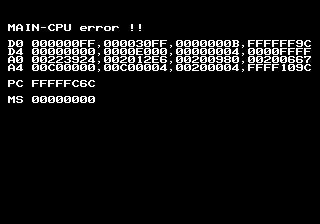 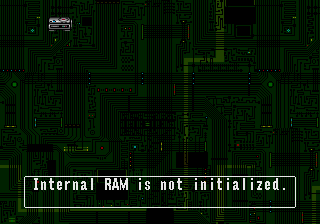 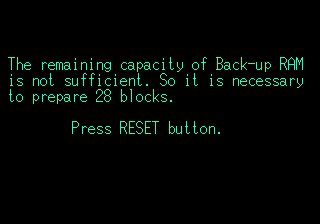 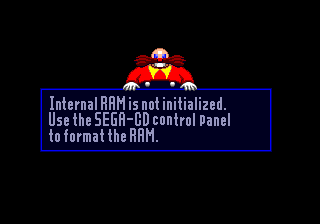 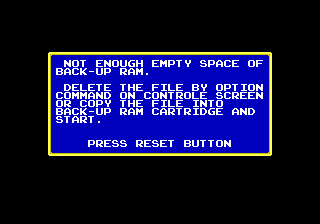 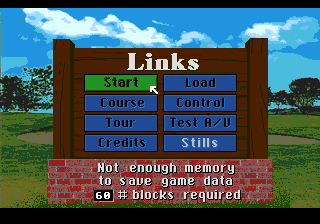 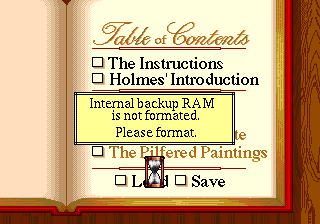 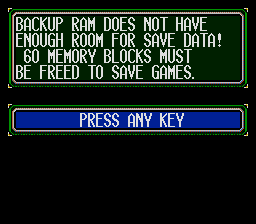 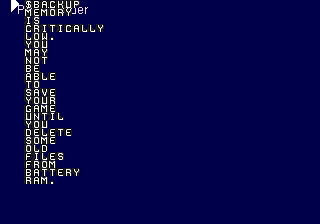 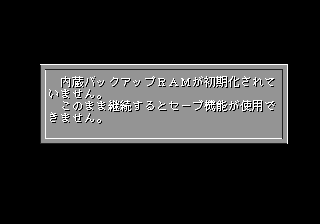 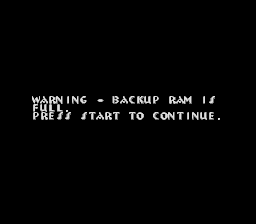 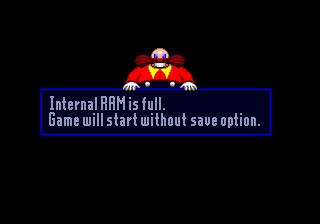 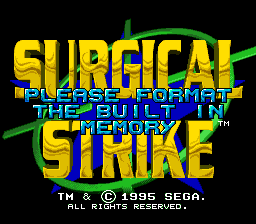 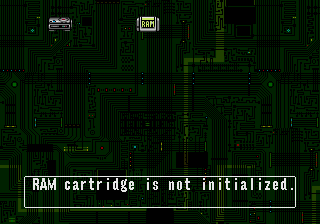 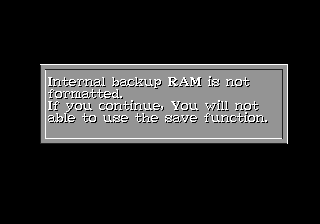 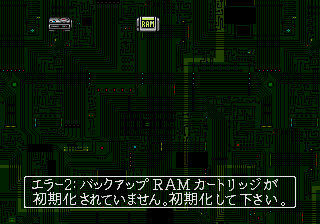 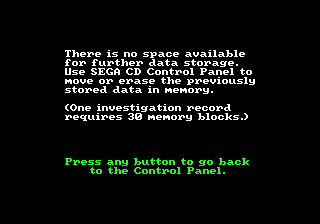 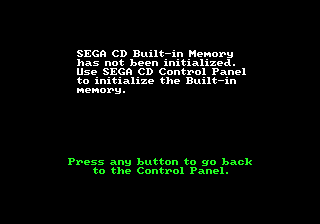 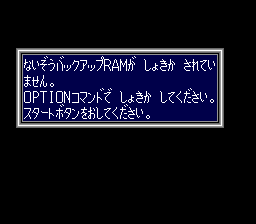 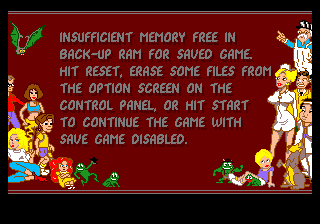 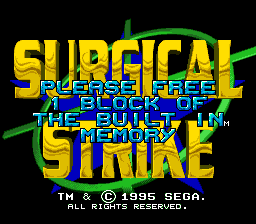 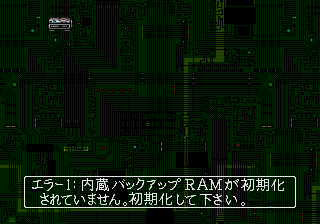 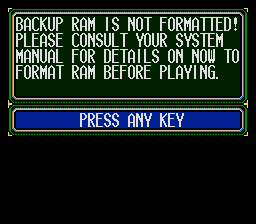 However, those aren't the only warning messages you could get, and this is where the TurboGrafx-16 and the Sega CD also come in: if the internal memory to save games was not formatted, or if it was full; you would trigger a warning too. 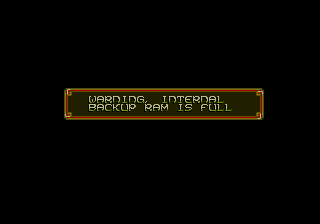 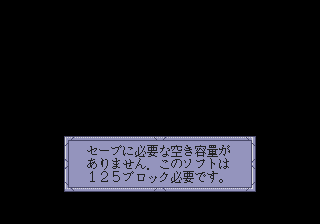 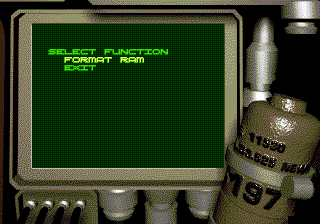 Usually these messages were accompanied by some gorgeous artwork, hilarious animation (check the Gradius 2 one!) 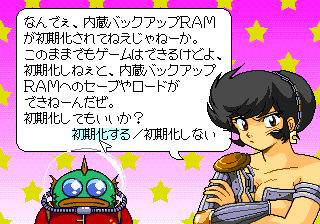 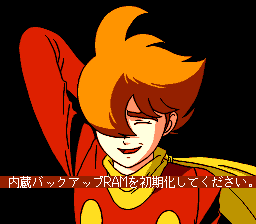 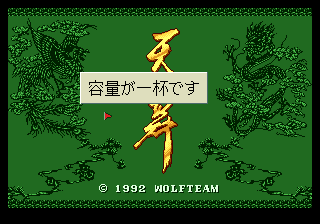 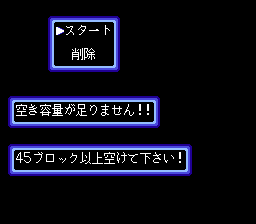 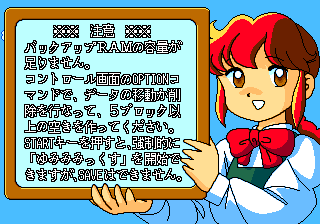 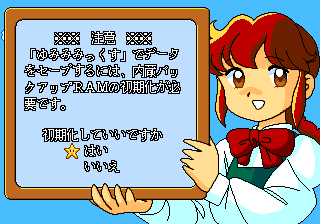 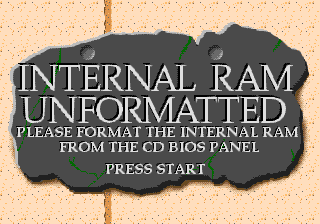 or voiced skit not found anywhere in the game, and some games even had cool easter eggs such as the famous joke stage in Akumajo Dracula X Rondo of Blood, or a full bestiary and music test in the Japanese version of Dragon Slayer. 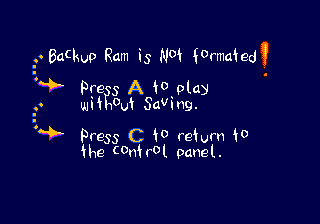 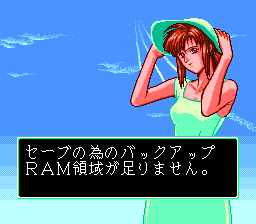 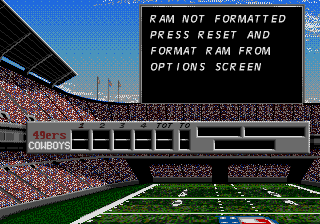 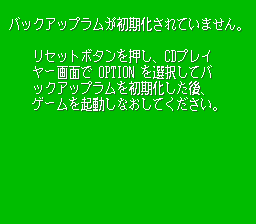 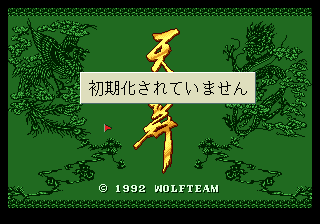 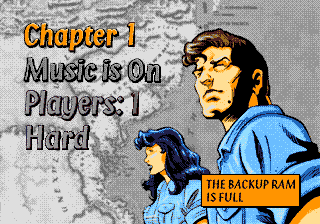 The TurboGrafx CD warning screens are mostly great, with a lot of beautiful content. 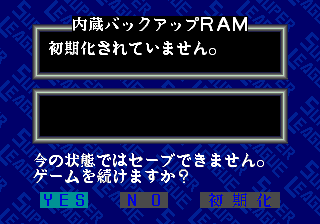 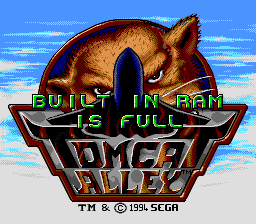 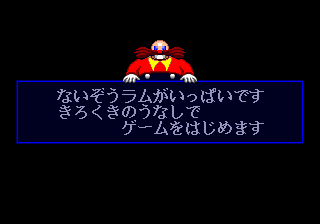 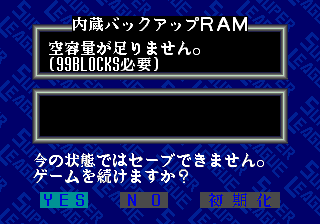 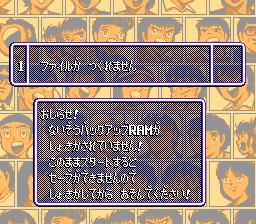 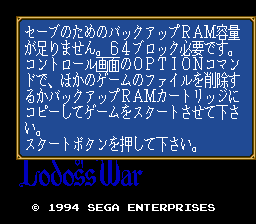 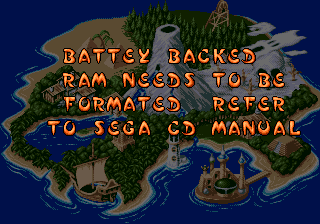 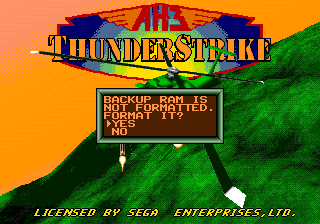 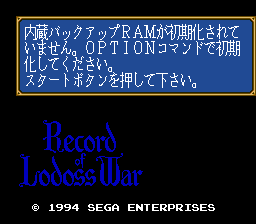 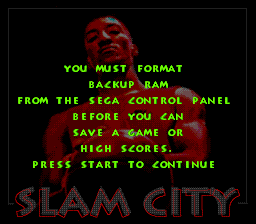 The Sega CD has a few good ones, but most of them are just text. 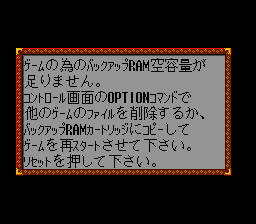 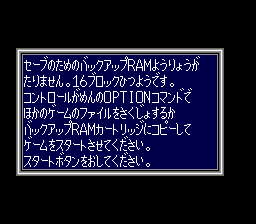 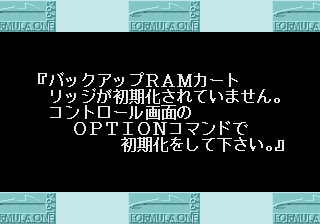 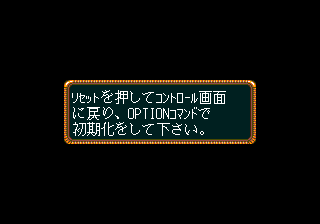 The TurboGrafx-16 ones are included for completition purposes since they are all basically text. 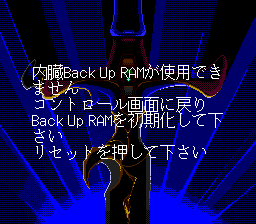 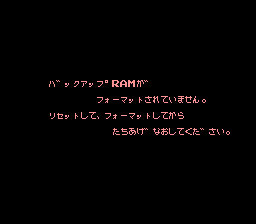 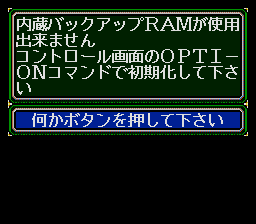 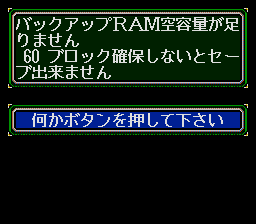 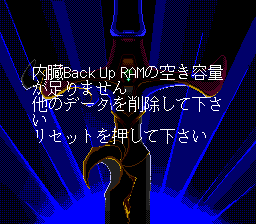 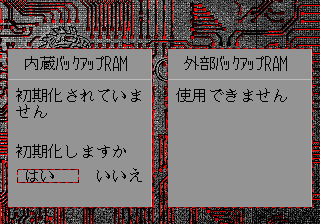 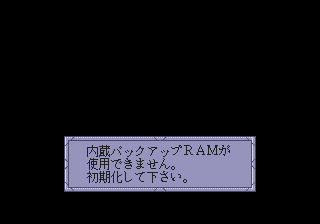 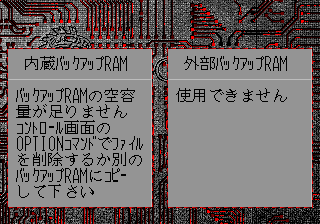 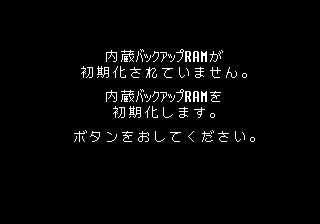 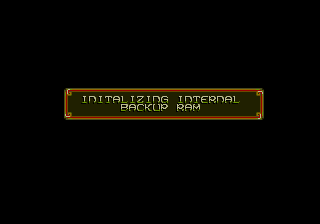 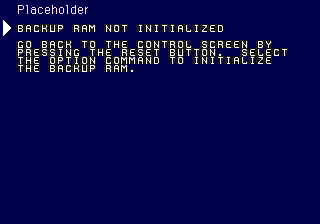 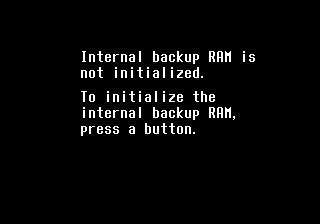 -Images on the left are for when the Backup RAM is not formatted / initialized, and the images on the right are for when the Backup RAM is full. 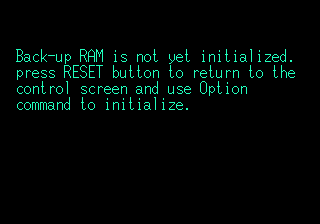 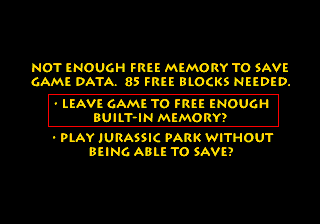 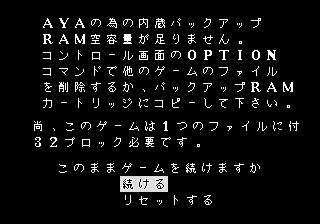 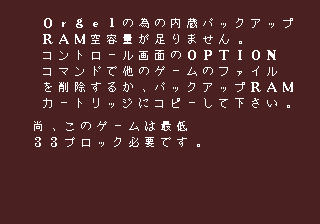 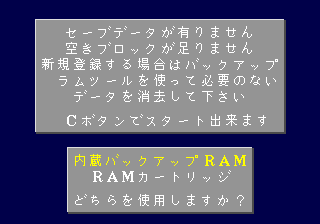 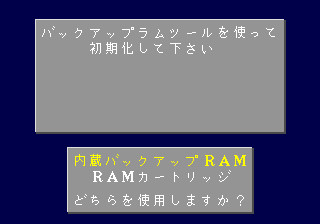 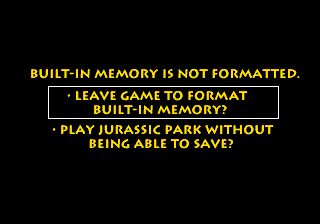 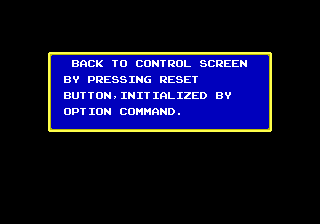 Some games only had a message for one of the situations, and would either continue normally or hang the game.